Nonalcoholic fatty liver disease (NAFLD) is one of the more common chronic liver diseases worldwide. It is associated with metabolic syndrome (i.e. insulin resistance and diabetes) and predisposes to cardiovascular disease. In a new study published in the Journal of Hepatology, researchers identified links not only between NAFLD and hepatocellular carcinoma (HCC), which have been well established, but also to cancers outside the liver, including colorectal and breast cancer. NAFLD is associated with the development of HCC, colorectal cancer in males, and breast cancer in females. 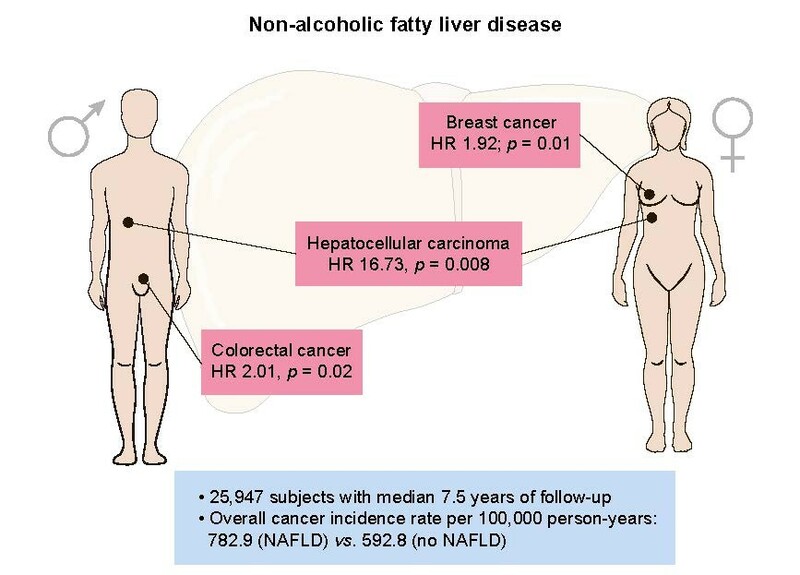 The article is “Association between nonalcoholic fatty liver disease and cancer incidence rate,” by Gi-Ae Kim, Han Chu Lee, Jaewon Choe, Min-Ju Kim, Min Jung Lee, Hye-Sook Chang, In Young Bae, Hong-Kyu Kim, Jihyun An, Ju Hyun Shim, Kang Mo Kim, and Young-Suk Lim (http://dx.doi.org/10.1016/j.jhep.2017.09.012). The editorial is “NAFLD and cancer: more cause for concern?” by Peter Jepsen, Federica Turati, and Carlo La Vecchia (https://doi.org/10.1016/j.jhep.2017.10.008). Both will appear in the Journal of Hepatology, volume 68, issue 1 (January 2018) published by Elsevier. Full text of these articles is available to credentialed journalists upon request; contact Sybrand Boer Iwema at +31 20 485 2781 or hmsmedia@elsevier.com. Journalists wishing to interview the study authors should contact Han Chu Lee at hch@amc.seoul.kr or Gi-Ae Kim at antiankle@hanmail.net. To reach Peter Jepsen for comment, contact him at pj@clin.au.dk.